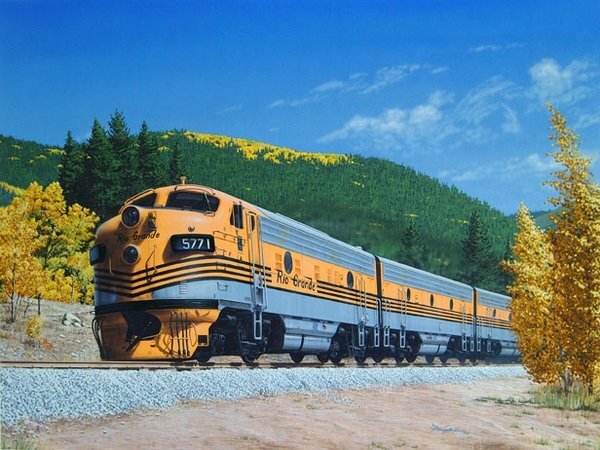 A Rio Grande F9A diesel with it's F9B helper units, head up a train through the aspen trees on a clear fall day in the Rocky Mountains. In 1939, EMD (Electro Motive Division) of General Motors began challenging the steam locomotives with the first of the diesel-electric 'F' units. These locomotives proved they could beat steam in nearly every category of efficiency and could pull freight as well as passenger trains. In all, over 7600 F units were built, with the last assembled in 1960 and was the top selling cab type unit of all time. Rio Grande F9A diesel locomotives with B units were used in mainline freight service between Denver and Salt Lake City and also used for passenger service on the California Zephyr in the 1960s and the Rio Grande Zephyr in the 1970s and early 1980s. on 100% acid-free cover stock.